In event that particular DTP wasn’t finished and while it was in progress there was a BW system shout down (regardless planned or not) going on such the DTP may have issues while running it after the systems was restored back. First error is very strange as the DTP is in the system. It is normally visible in RSA1/RSDTP t-codes. When you check the tables like RSBKDTP – the DTP entry has regular Active record there. Reactivation of the DTP doesn’t help either. Corresponding transformation is in active state too. Its check doesn’t report any issues. Entry in table RSTRAN is active for the transformation too. Reactivation of the transformation doesn’t help as well. What needs to be done is just run the DTP standalone outside of PC. 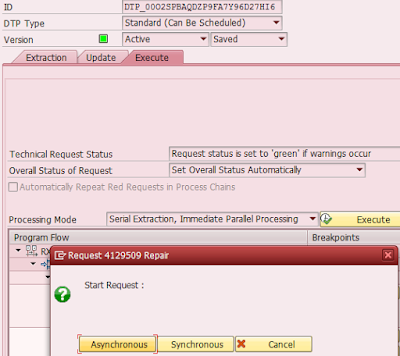 During such an attempt the BW system will ask to delete/repair previous run of the DTP that caused red load request in target. Once you confirm it shall be repaired – system asks whether it shall be done synchronously/asynchronously. After any of the two options is confirmed the DTP is successfully executed and data loaded.